The best love quotes for her from a romantic are full of love, hope and promises. Love is the most beautiful thing in the world and there is hardly anyone else who is more driven and motivated than a man who is in love. They say love can move mountains and it is true in every sense of the word. It is the most powerful force or feeling that is, something that lasts for eternity and can still be subtle and beautiful and can touch anyone’s heart. 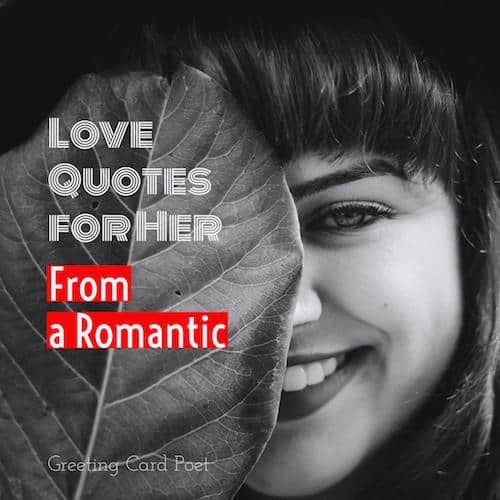 These love quotes for her are the perfect sayings you can share with someone who is special for you – someone whose thoughts keep you dreaming and smiling all day. Share the love word that is in your heart with your beloved and let them know what you are thinking of and what you can do to make your dream true. No matter what has happened. No matter what you’ve done – No matter what you will do. I will always love you. I swear it. 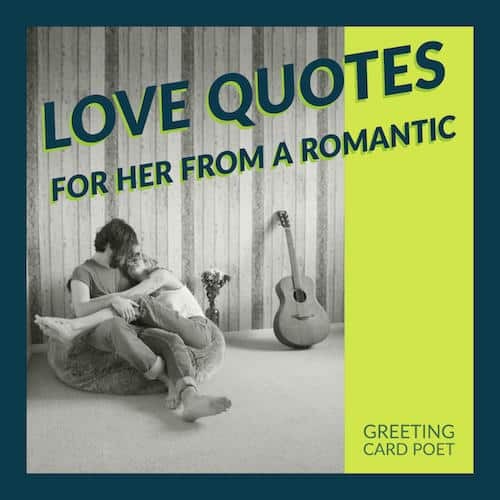 Note: These love quotes for her are great in notes, texts and gift cards…especially gift cards. The day I met you my life changed forever – for better. If you like these romantic love quotes, you might like: Inspirational Love Quotes. For where thou art, there is the world itself, and where though art not, desolation. I am certain of nothing but the holiness of the heart’s affections and the truth of imagination – what the imagination seizes as beauty must be truth – whether it existed before or not. Tip: Try using some of these love quotes for her on a daily basis. Treat the ones you love the most the best. I have died every day waiting for you darling, don’t be afraid I have loved you for a thousand years, I’ll love you for a thousand more. One of those love quotes for her that is spot on. Your voice makes me tremble inside. And your smile is an invitation for my imagination to go wild. A part of you has grown in me. And so you see, it’s you and me. Together forever and never apart, maybe in distance, but never in heart. My feet dance more lightly because of you. My heart beats more strongly because of you – My eyes see more clearly because of you – My mouth smiles more easily because of you. And, my life is simply better because I love you. I love thee with the breath, smiles, tears, of all my life – and if God choose, I shall but love thee better after death. I have nothing special to offer except my capacity to love you. When I’m with you hours feel like seconds. When we’re apart days feel like years. Thinking of you keeps me awake, dreaming of you keeps me asleep, Being with you keeps me alive, but most of all Loving you keeps me happy. But I love you I’m totally and completely in love with you and I don’t care if you think it’s too late. I’m telling you anyway. I want you. All of you. Your flaws – Your mistakes. Your imperfections. I want you, and only you. Love is too weak a word for what I feel. I luuurve you, you know, I loave you, I luff you, two F’s, yes I have to invent, of course I do, don’t you think I do? Tip: Read through a handful of these love quotes for her daily for a week. Then, try to take a couple of your favorites and word the best concepts into a message of your own. Unconditional love really exists in each of us. It is part of our deep inner being. It is not so much an active emotion as a state of being. It’s not ‘I love you’ for this or that reason, not ‘I love you if you love me.’ Its love for no reason, love without an object. Love is not blind – It sees more and not less, but because it sees more it is willing to see less. I will love you my whole life. You and only you. When forever becomes a place…when forever ceases to be just a word… when it ceases to be just a measurement of time…but instead becomes a place where soul mates can dance to the song in their hearts… that is a reflection of true love. True love is not a strong, fiery, impetuous passion. It is, on the contrary, an element calm and deep. It looks beyond mere externals, and is attracted by qualities alone – It is wise and discriminating, and its devotion is real and abiding. True love is eternal, infinite, and always like itself. It is equal and pure, without violent demonstrations. The eyes told what heartfelt. True love is felonious… You take someone’s breath away… You rob them of the ability to utter a single word – You steal a heart. Tip: Some of these Love Quotes for Her make great photo captions on Facebook, Instagram and more. Love is such a tremendous force of feeling. When you can’t stop loving, you simply cannot stop it. I don’t need to know you to love you. I’ll start by loving you and see what I come to know from there. Loving you is a beautiful dream. I will never stop loving you, I know it’s a cliché but it’s damn true. Yes. Loving somebody isn’t a one time thing, it’s an everyday thing. Something you do to them, with them, for them. Because of them. Every day, all day. And night. If loving comes easy, nothing else seems hard. Note: If you have suggestions for Love Quotes for Her, please let us know via the contact page. Thanks. Never set limits when you are loving someone. Loving someone isn’t about what you can live with, accept or tolerate. For me, it’s about the one person you can’t live without. Too know that part of your life will never be the same without that one person being apart of it. You’re on Love Quotes for Her from a Romantic.